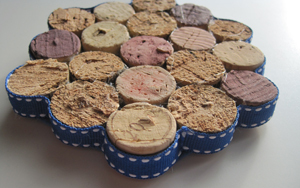 This is a tutorial for coaster made from wine corks. I can’t take credit for this idea – I got it from Apartment Therapy. It is pretty much as simple as cutting apart corks and gluing them back together, but I’ve got a few tips and tricks that I learned while making mine that should help you with yours! You’ll need 5 corks per coaster (if you make them the same size I did. More on that below). The first thing to note is that corks come in different sizes. I found it didn’t matter that much if they were off a bit in circumference, but the length differences can make it hard to get a flat coaster. I suggest clustering your corks into groups of 5 that are roughly the same length. There are many different ways that you can cut apart your corks. The simplest is a pair of scissors, which works, but leaves a jagged edge that can lead to bumpy coaster which can lead to spilt drinks which isn’t good. I had the best results with this little fine-toothed hack saw. It does leave little cork crumbs, so you’ll want to have a vacuum handy for after you are done cutting. Now you have to decide how deep you want your coasters to be. On the left is corks cut in half, on the right is corks cut in 1/4. Decide now! I made my coasters first with corks cut in half and then decided I wanted them all shorter. It’s a lot harder to cut them once they are glued together and you’re cutting through glue as well. I think the 1/2 cut corks work well as trivets and the 1/4 cut as coasters, but it’s your call. Start gluing them together. I found it easiest to start by gluing 3 corks in a row. You don’t need to use a ton of glue. I built the hexagon from left to right, but do what works for you. At this point you get to decide how large you want your coasters to be. I like my coasters with 5 vertical rows of corks with 3-4-5-4-3 corks each in them. The trivets that I made worked better larger, with 7 vertical rows of 4-5-6-7-6-5-4 corks in each of them. As you are assembling the coasters, you get to decide which side is up and which side is down. You can make coasters with all cork ends up, all cork middles up, or a mix of both. Some corks will be darker than others. You can cluster dark ones together or scramble them around. Go to town! Next step is gluing ribbon to the side. It’s as simple as it sounds. Just note that the ribbon will have to be pretty narrow if you quarter your corks. You can finish the edge of the ribbon by folding one end over and overlapping that end over the other raw edge. Start gluing at the raw edge. …and if it runs through the middle of the cork, like on my trivet. The penultimate (I’ve always loved that word) step is gluing felt on the back. It can be nice 100% wool felt or cheap craft felt. It won’t really ever be seen and both will hold together the coaster and protect whatever surface it sits on. I recommend using quite a bit of glue at this step, but work quickly because if the glue dries before you get the felt on and smushing it flat, it will leave an uneven surface and we’ve already talked about why that’s bad! The final step is to flip the coasters back over and squeeze some hot glue in between the corks from the top. This will anchor them firmly to the felt and anchor them firmly to each other. Be a little careful because you don’t want the glue dripping on the top of the exposed cork. Smile! You’re done!